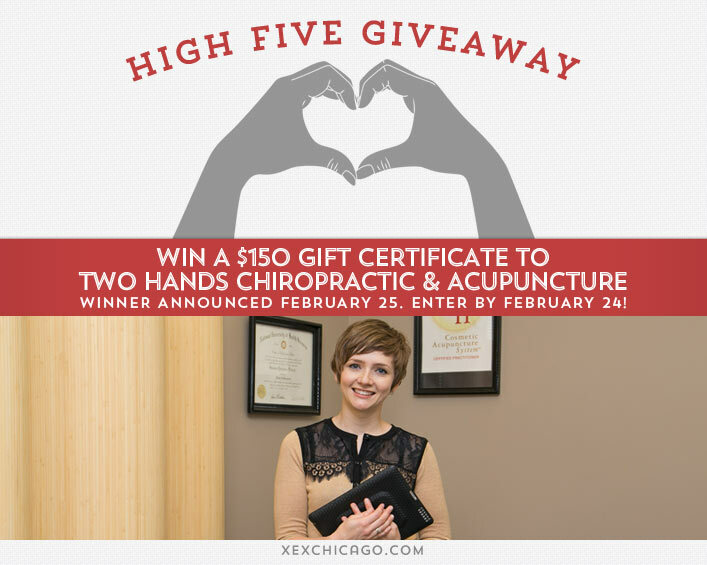 Win a $150 Gift Certificate to Two Hands Chiropractic & Acupuncture! Congratulations to Shannon Hallberg on winning our sixty first High Five Giveaway and thank you to all who entered! Our next High Five Giveaway is for one cosmetic acupuncture treatment at Two Hands Chiropractic & Acupuncture (valued at $150). Two Hands Chiropractic & Acupuncture is located at 111 N Wabash Ave, Suite 1414, Chicago, IL 60602. Visit their website at twohandsforhealth.com or call them at 312-634-0740. Now, just add a comment to this post with the right answer to be eligible to win! The winner will be announced on Tuesday, February 25. Entries must be received by midnight on Monday, February 24. Good luck! All individuals 21 and older are eligible, whether you are a client of XEX or not. Must be able to pick up the gift certificate at XEX, 35 West Wacker Drive, Chicago. Gift certificates may not be redeemed for cash and may only be used for a cosmetic acupuncture service. Leaving a comment opts you in for the XEX email list, which is sent out 1-2 times per month. You may unsubscribe at any time. Biotin, also great for your nails!